Sheet packing which is commonly refered to as gasket material can be produced from a wide range of raw materials. Those materials include: Flexible Graphite, Variuos rubbers (Nitrile, SBR, EPDM, Neoprene, etc. ), rubber and reinforcing fibers (Aramid, Fiberglass, Mineral Fibers etc. ), PTFE and PTFE composites, Mica etc. Types of braid: One of the most common methods of braiding is in a square braid. Sheet Gasketing or Gasket Material is available in a wider range of materials, grades and quality. Like the old oil filter commercial, when it comes to gasket materials the phrase pay me now or pay me later applies. The first thing any consumer should be looking for especially when dealing with Industrial applications and the safety of workers is a gasket material that comes from a quality manufacturer. In recent years, just as with most things we see on the store shelves manufactures have outsourced the production of gasket materials to reduce labor, freight (in the case of Texas consumption) or avoid the environmental issues involved with the solvents used in the production of many gasket materials (especially non-asbestos). In the case of non-asbestos gasket material, most USA manufacturer has shipped much t of the production offshore to: Mexico, India, Brazil, Canada or China. In some cases this is done in plants that still make asbestos gasketing (China and India), and cross contamination is a potential issue. In the case of Flexible Graphite sheet, much of the production is now coming from China. Union Carbide originally developed Flexible graphite gasket material under the brand name “Grafoil”. Today it is still among the best on the market. The mines for the graphite Union Carbide (now GrafTech International) used are located in Madagascar. They chose that material for the purity of the graphite. The second issue is the method of manufacturer. Like most things there is a cheap way and an expensive way to do things. The cheap way to make flexible graphite is using sulfuric acid in the process. Sulfuric pops the graphite like popcorn worms, which is the desired effect however, it leaves your gasket material smelling like rotten eggs, and will cause pitting and corrosion on your flanges (pay me now or pay me later). The best quality flexible graphite gasket material comes from Graftech (USA), SGL (Germany), Nippon Pillar (Japan), FMI (Italy) and Mersen (France). If you find a great price on flexible graphite gasket material, chances are it is not coming from one of these sources and you will pay for it later. It’s easy to identify the quality brands, they will all be branded. If your flexible graphite gasket material is not branded you can assume it’s an inferior material and may cost you more to use in the long run. PTFE materials come in several forms. If the PTFE resin used to make the gasket material came from Dupont, it can be called Teflon. Otherwise, it’s called PTFE. 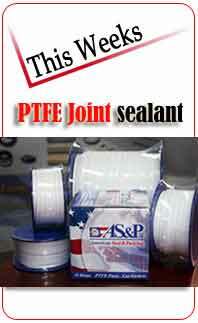 PTFE comes from both quality and inferior sources. Generally speaking most of the PTFE we have seen on the market is pretty good. Where inferior PTFE’s really show themselves is when they are combined with other materials. The most common forms of PTFE are pure PTFE, Expanded PTFE (EPTFE), and composite PTFE gasket materials. The composite PTFE sheets very significantly in quality and performance. If a PTFE is formed into a bun and skived, it will have significantly different tensile strength in the X and Y directions. This is significant to a gasket because it will not resist cold flow or pressure in uniformly, making it easier to “blow out”. Dupont developed what is called the HS10 process (Garlock refers to it as the “Gylon Process”), which layers the PTFE composite in different directions, compresses them together and then sinters the sheet in an oven. There currently are only 5 companies in the world that use this gasket material process (that we are aware of). Garlock, FMI, Flexitallic, Teadit and Lamons. If you want a quality product insist on one of these 5. To be sure your getting what your paying for make sure it is branded.